The O’Neal School English Department has now opened a Writing Center to help Middle and Upper School students with their writing projects. Located in the McMurray Library of Bradshaw Hall, English teachers in O’Neal’s Middle and Upper School divisions are reserved as Consultants for students by way of an electronic sign up system located on the school’s website portal. “The Writing Center aims to provide students with the necessary resources and support to help them produce their best writing. It is not designed to supplant the teacher's role but, rather, to complement it. 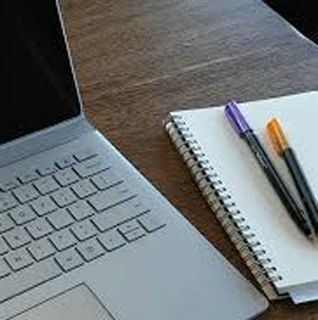 While we refrain from copyediting, Writing Center Consultants work, instead, to assist students in locating their own patterns of error and discovering strategies to improve it," says English Department Head Nicole Camastra. 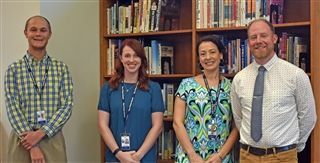 Presently, Writing Center Consultants are Upper School English teachers Abby Gibson and Sean Harrell, along with Middle School English teacher Zach Oden. Students may sign up for 20-minute sessions no less than 12 hours from the desired appointment time. This encourages deliberate thought about the composition process. Students are asked to come prepared with a specific question(s) or issue(s) related to their paper. In an effort to expand writing across the curriculum, Consultants also offer mini workshops to a class on anything from grammar to thesis statements to research strategies, regardless of discipline.